A cult band even for black metal, Austrian trio Dornenreich are back with album number seven, a return to black metal having strayed from the path lately with previous opus In Luft Geritzt being completely acoustic. 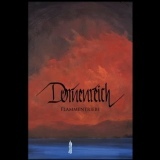 Interestingly, however, the band don’t drop their neofolk influences but incorporate them, making Flammentriebe an interesting listen. Compelling folk melodies are mixed in amidst the black metal, avoiding the saturated pagan metal sound in favour of something far more individual and progressive. Of the three individuals who make up Dornenreich, Inve contributes just the violin, and the importance of his presence is clear in moments such as the rather pretty opening to Der Wunde Trieb, a recurring melody brightening the otherwise fiercely aggressive assault. Not that the other members (Eviga on guitars and vocals and Dragomir on drums) make less of a contribution, but it’s often quite easy to pick out Inve’s violin amidst the sometimes quite complex structures of these songs. There’s a tinge of post-rock influence discernable amidst the raging black metal, but it’s never indulged, never allowed to dominate, and the music is all the better for it, as genuinely compelling songs such as Tief Im Land prove. It’s hard to tie Dornenreich down, as they seem to go out of their way to defy easy categorisation. Vocals are not the usual screams, for example, but passionate snarls that straddle harsh and clean in a way that few black metal bands even attempt, with some surprisingly arresting spoken phrases. In some ways, this is a throwback to the 90s of black metal, where folk influences were worked into the metal elements of bands like Satyricon with ease, and the genre was genuinely experimental without forsaking tradition. Fascinatingly, the ‘medieval’ style of then is replaced here with a modern folksiness capable of both catchiness and atmosphere simultaneously – Wolfpuls a great example, both acoustic strums and electric riffs used to great effect. What ultimately seals the deal for me is that Dornenreich are audibly capable musicians, and their songcraft extends to the underappreciated art of making each song stylistically similar yet very different in execution, meaning that the album as a whole stays interesting all the way through. You can listen to the acoustic strums, whispers, ominous drum rolls and walls of guitar in opener Flammenmensch, and stay as interested for the later jazzy percussion patterns of the amusingly-titled Fährte der Nacht. Each has different strains of epic black metal woven through, of flexible structure yet careful to lose neither the chaos nor melancholy typically found in European black metal. That figure on the front cover, alone in front of the glory of the natural world (a frequent motif for past Dornenreich releases, about which I know all too little) is ultimately best summed up by the laid-back melody of album closer Erst deine Träne löscht den Brand, beginning as pure folk and building up to a glorious instrumental piece where guitar and violin exist at once without merging, painting ambient streaks of fiery red across the sky of your imagination. Recommended.